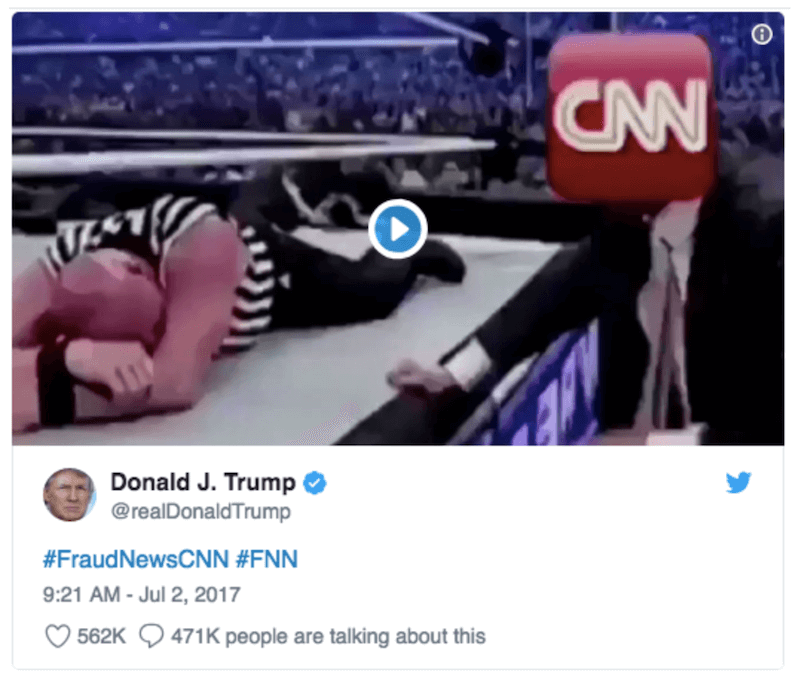 Leading up the midterms, media/fake-news, Russia and at different times, immigration and the Supreme Court have been shown to polarise the group of followers. Most recently in October 2018, healthcare has jumped up as a more polarizing topic. 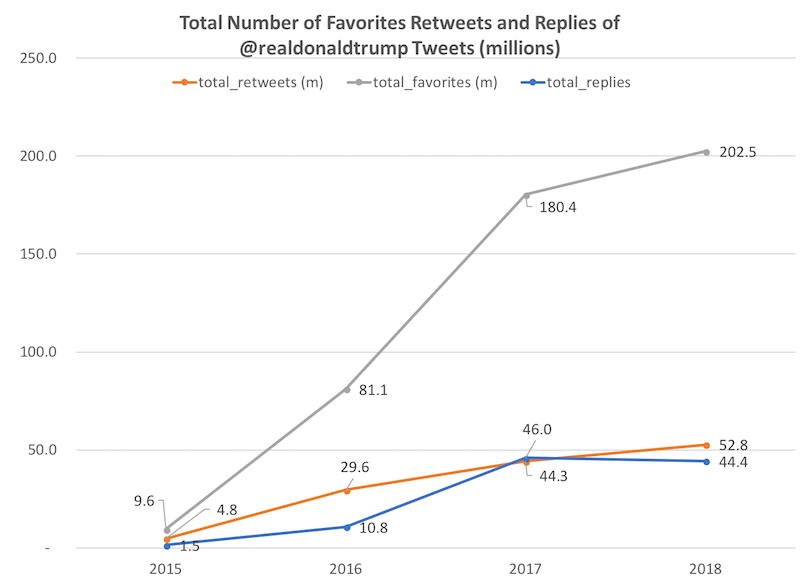 Our analysis additionally implies that President Trump and his team would have been able to consistently survey a base of followers at a level that has never been done at this scale before in politics. This could also allow interest in new policies and engagement to be tested and help suggest what issues the Trump administration should focus on to motivate and engage his base. 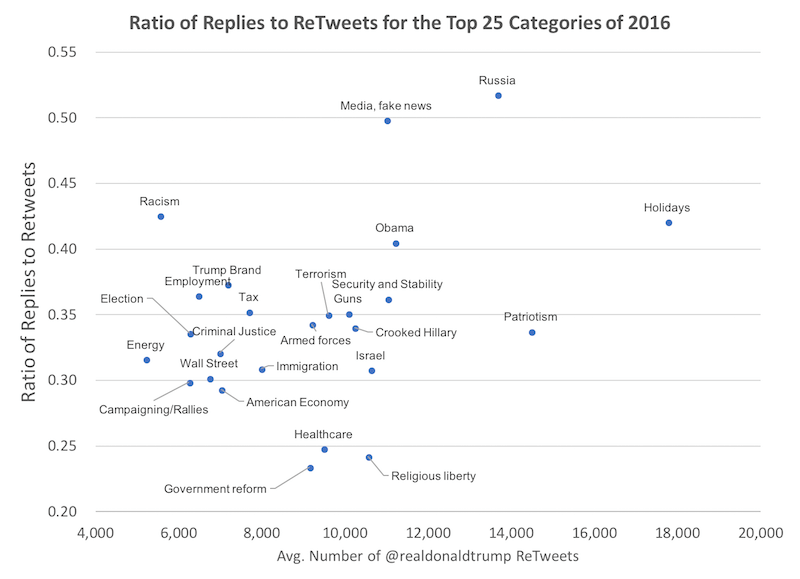 The chart below illustrates how the topics that the base of Donald Trump are most focused on (retweets show positive endorsement). Note that immigration is the fasted growing topic leading up to the midterms. 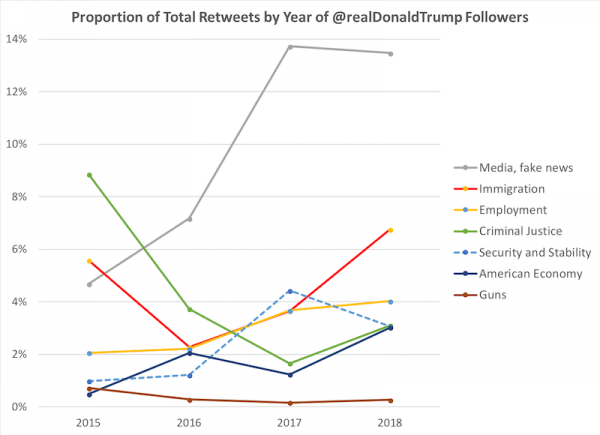 The increase year or year of President Trump’s twitter follower base shows a ten times jump between the end of 2015 and October 2018, the biggest increase coming once he became President. Today, over 17% of the users on Twitter follow @realDonaldTrump. Before we review the content of the tweets, we’ll first summarise President Trump’s overall behaviour. We’ve seen a sharp drop in the number of tweets per year. This is driven by two factors. 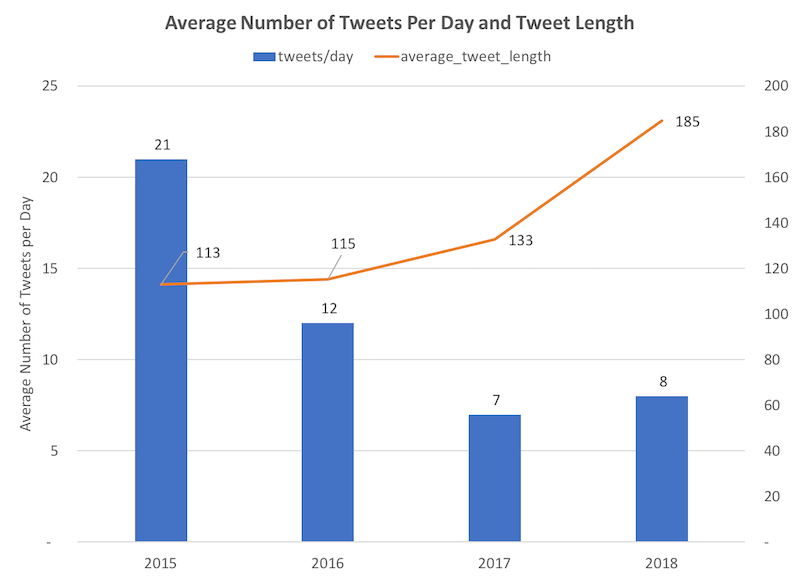 First, we see fewer tweets per day and second, in late 2017, Twitter increased the maximum number of characters per tweet from 140 to 280. This led President Trump to write about 40% longer tweets. 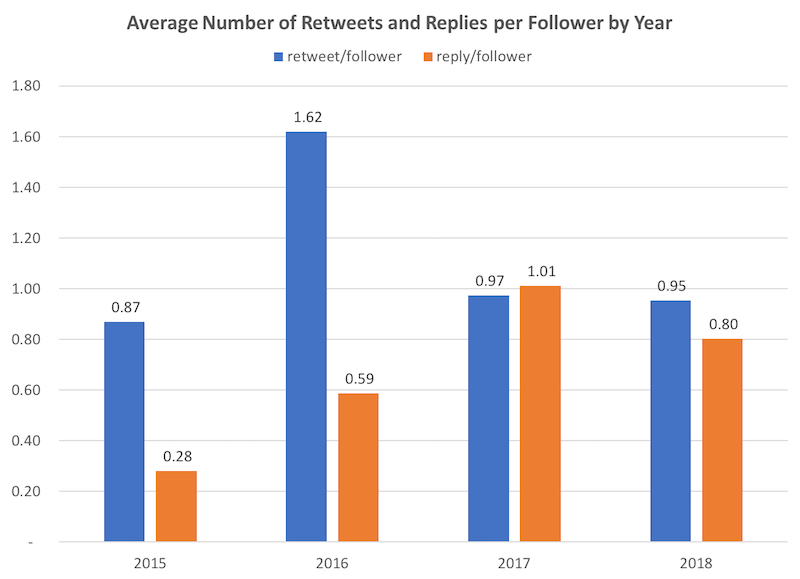 In this analysis, we have chosen to focus on retweets as the simplest metric of positive engagement and replies of tweets as the metric for negative sentiment. This is based on previous work in the area including the the ratio of the two measures. Replies/Retweets and is known as “The Ratio” (see Esquire and FiveThirtyEight sources) and shows the balance of sentiment, greater than 2:1 points to a negative sentiment. We acknowledge there are many different methods for how to measure engagement on Twitter and we cover some of the alternatives in the Appendix. Our first chart shows how much the activity of the followers of has grown. This is largely driven by the increase in the total amount of followers as shown in the chart above as well as the breath of followers. 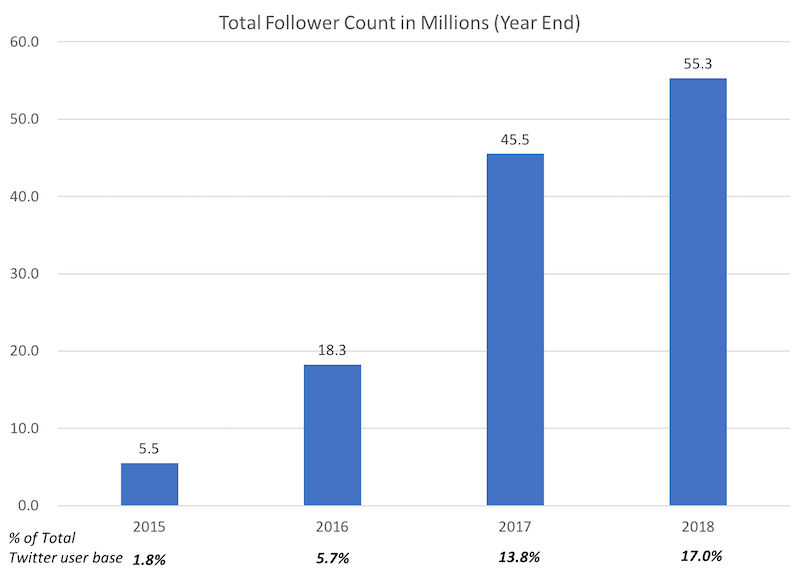 We can also see from the chart above is how active the follower base was during the election year of 2016 with a much higher proportion of positive engagement per follower. As the number of followers has grown larger and presumably broadened, the balance of negative responses (ie replies) increased significantly too. 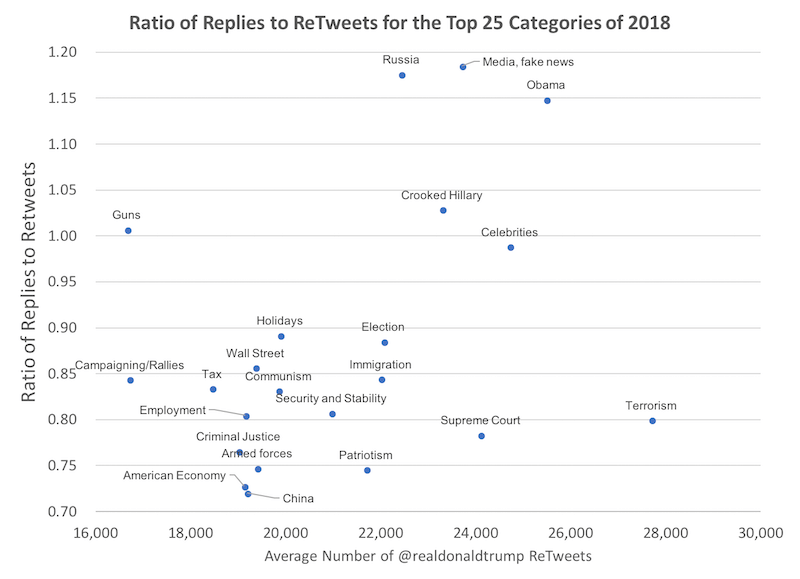 Ratio of replies to retweets (The Ratio) to assess the level of negative sentiment towards a @realDonaldTrump tweet, the higher the number, the more negative the sentiment. See the Methodology section at the end of this document for more detail on these metrics and relevant sources. 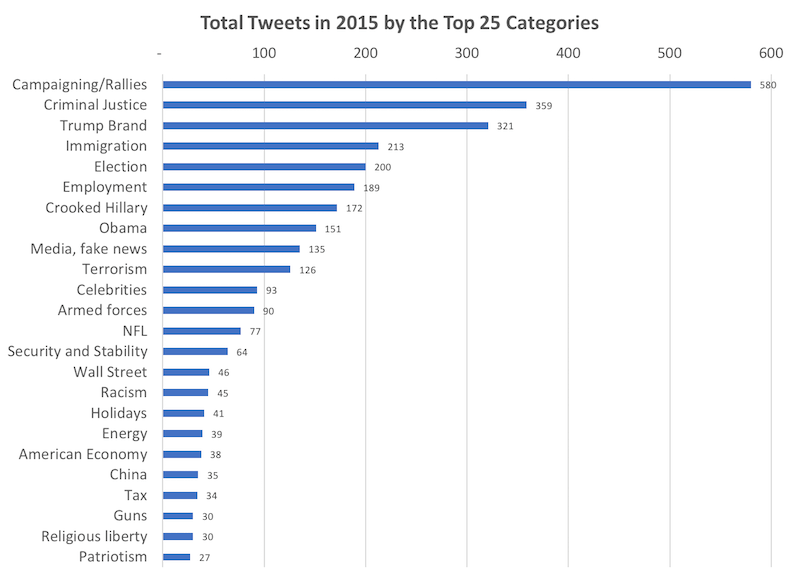 Out of the total number of 7,536 tweets in 2015, the most common topic was Campaigning/Rallies. Within that year, 4.3% of tweets were about promoting the Trump brand or Trump products. 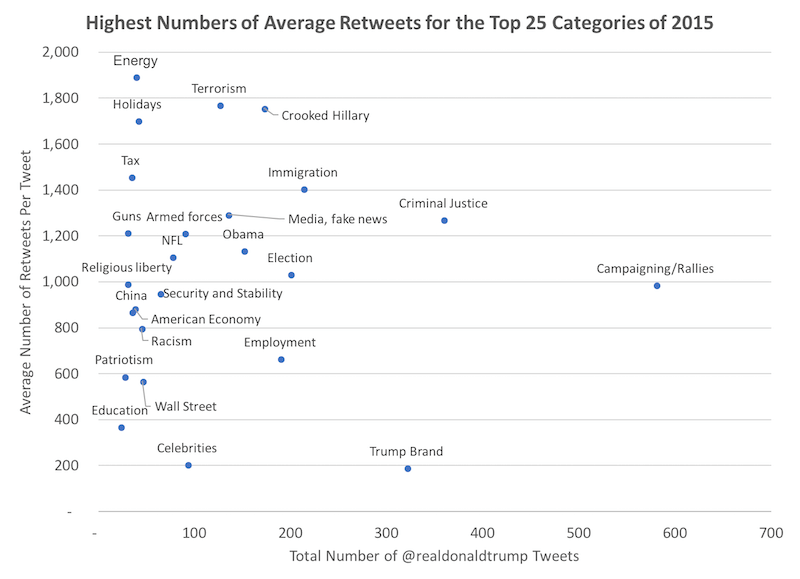 By next looking at the average number of retweets for these top 25 categories, we can see which areas the base (followers) were most engaged about. 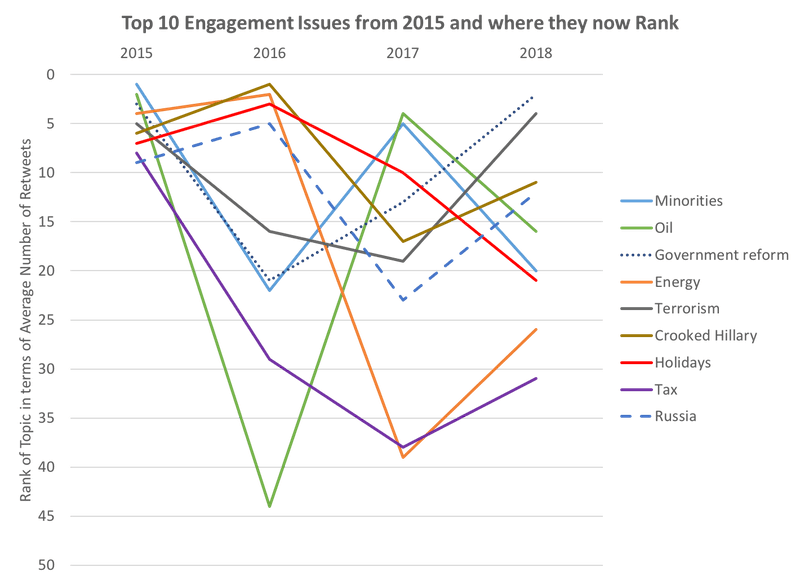 Energy, terrorism and Hillary Clinton were already the topics driving a lot of engagement in base back in 2015. We are not surprised to see the least engagement for re-promotion of Trump Brands which is at the bottom end of the chart (although a very active area for President Trump). In 2017, the total number of tweets falls again, this time by another 38%. The conversation changes again, the most well known increase coming from that of the “fake-news/media” lexicon. Employment, tax and healthcare all enter the conversation as key areas of policy focus. 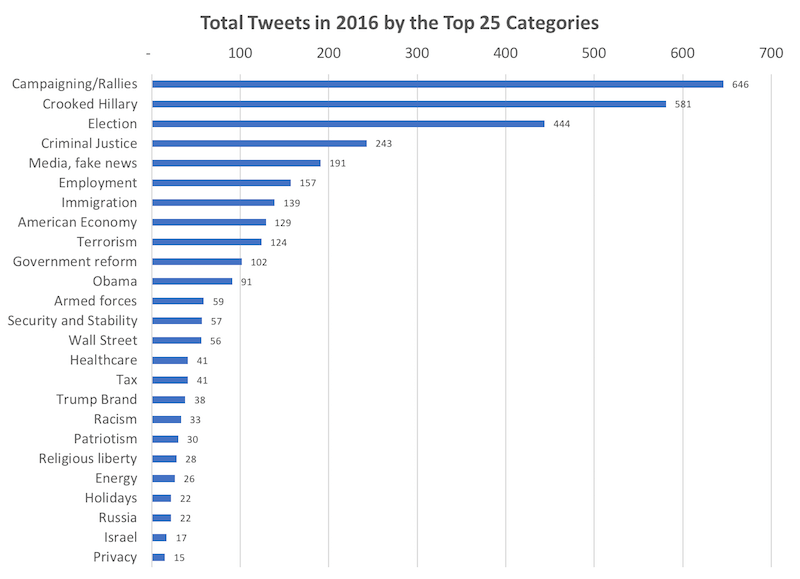 Looking to where the base was most engaged on in 2017… In 2017, the most polarising topics (ie highest ratio of replies to retweets) was media/fake-news and healthcare, the former a highly engaged positive issue for the base. China also enters the conversation in 2017. 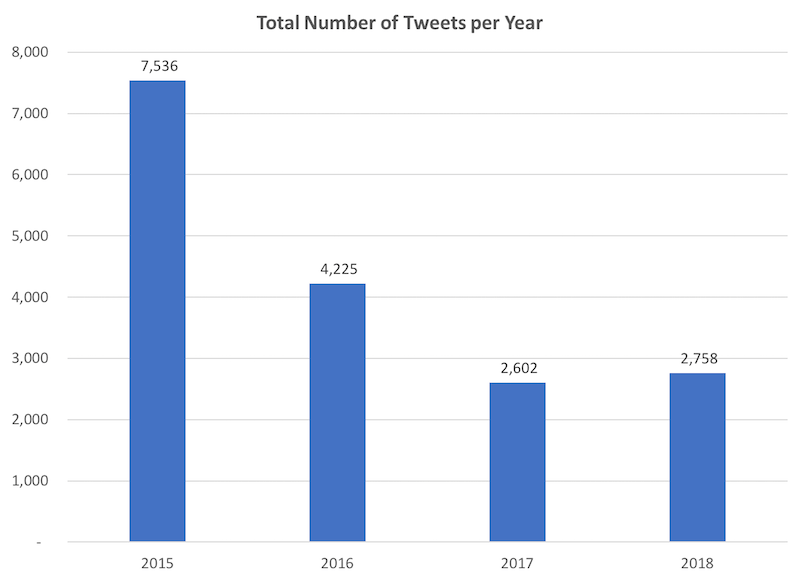 2018 saw a 5% year on year increase in the number of tweets but 2018 was also the first full year after Twitter extended it max character length for tweets so fewer tweets were needed to make the same point. 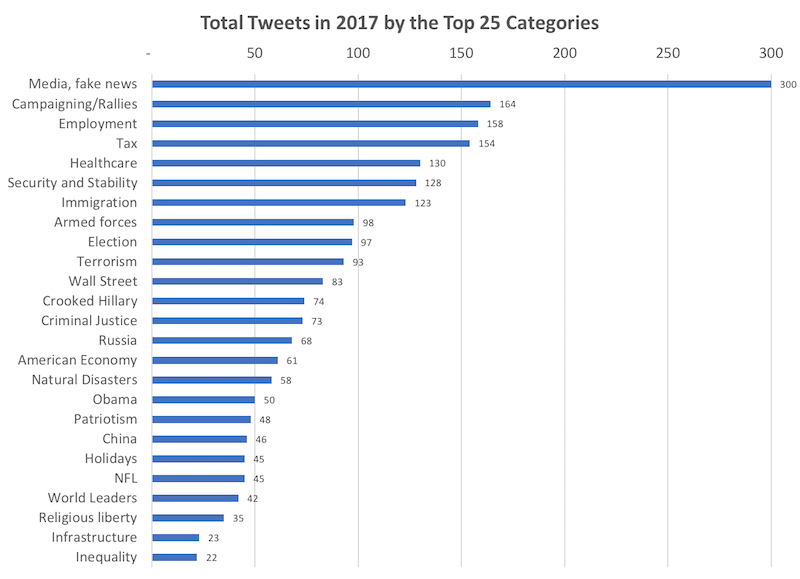 A lot of the same topics in 2017 can be seen at the top of most tweeted list for 2018. What we do see is a different set of hot engagement topics in 2018 with terrorism moving up to the top and the Supreme Court moving up as well. It is also worth looking at how President Trump has changed the style of the conversation over time. From 2015 to 2016, as we would expect, there was a big jump in focus. 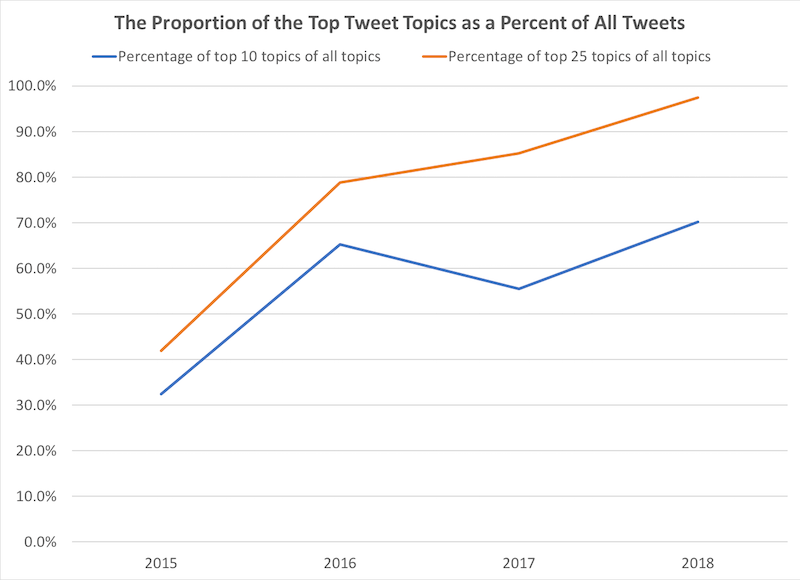 The efforts spent on the top 10 topics has remained relatively steady but what has changed is overall focus. 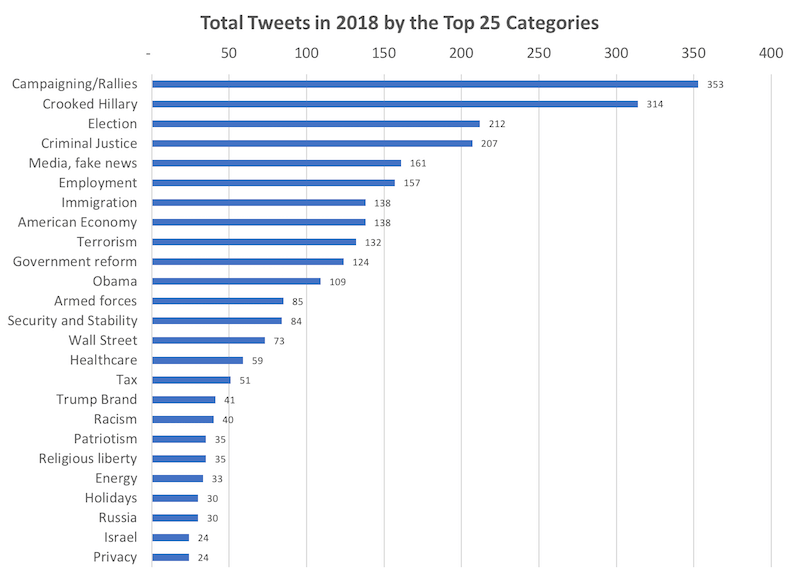 Of the 50 topics we have categorised, the top 25 for 2018 accounted for nearly 100% of all the tweets. President Trump has found the topics he and his base care about most and these are what time and effort is being spent on. Additionally as President Trump was a private citizen and not actively campaigning for parts of 2015, we would expect to have seen a broader range in that time. We can also see that of the top 10 topics that President Trump focused on 2015, seven have remained as focus issues. 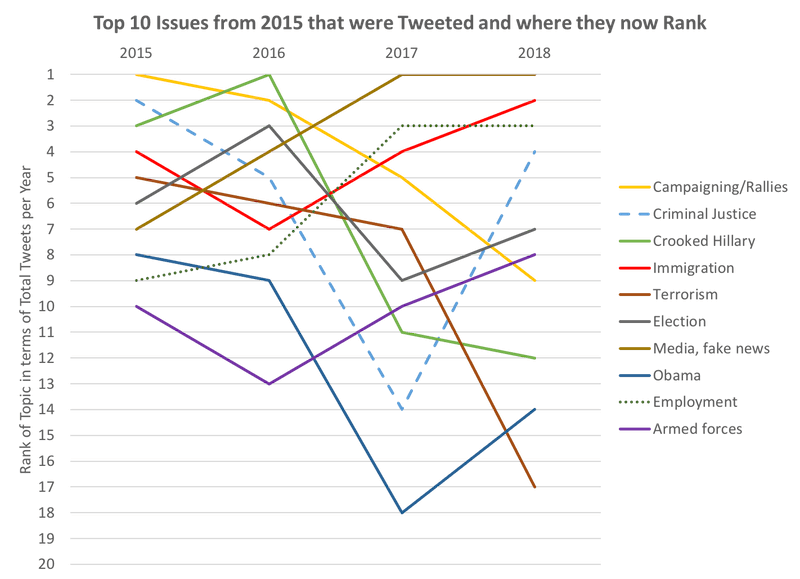 How much have the 2015 issues remained a focus? 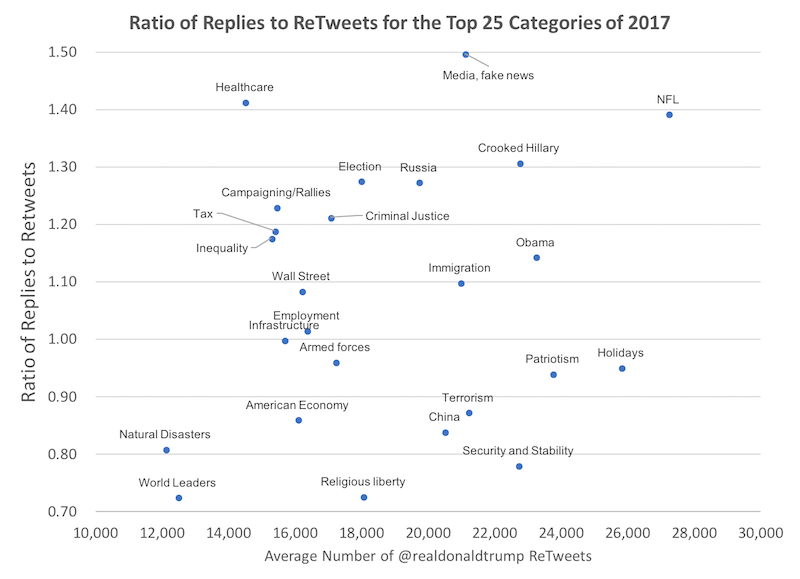 The issues that President Trump focused on 2015 have become less and less important to the base over the last four years as positive engagement has declined for nearly all of the hot topics of 2015. 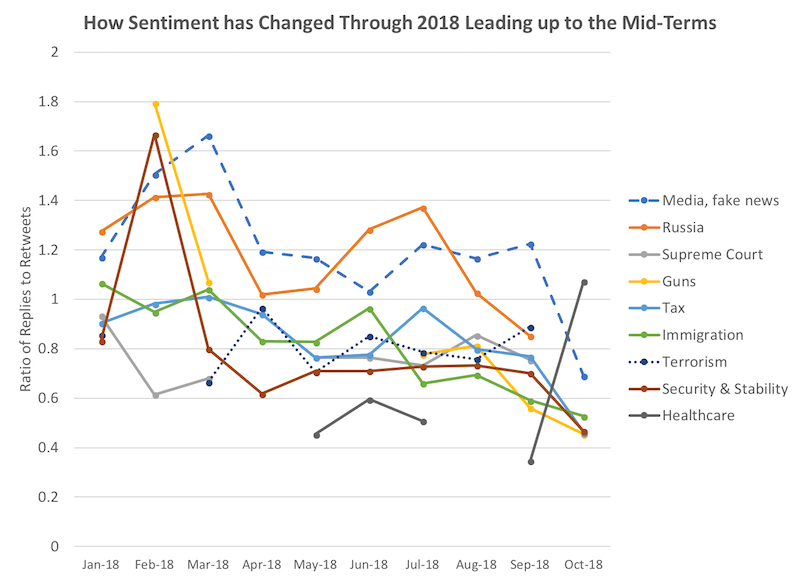 *”Minorities” refers to the Black Lives Matter movement and related commentary How sentiment has changed leading up to the Midterms We’ve looked at the Ratio or replies to retweets of major topics through 2018 to see how sentiment has been changing. The most polarising topics leading up the midterms through 2018 have been media/fake-news, Russia and at different times, immigration and the Supreme Court. Most recently in October 2018, healthcare has jumped up as a more polarizing topic. We will be watching closely to see how the final days of campaigning are responded to on Twitter.